The evening before and the evening after the wedding has many a sweet moment. 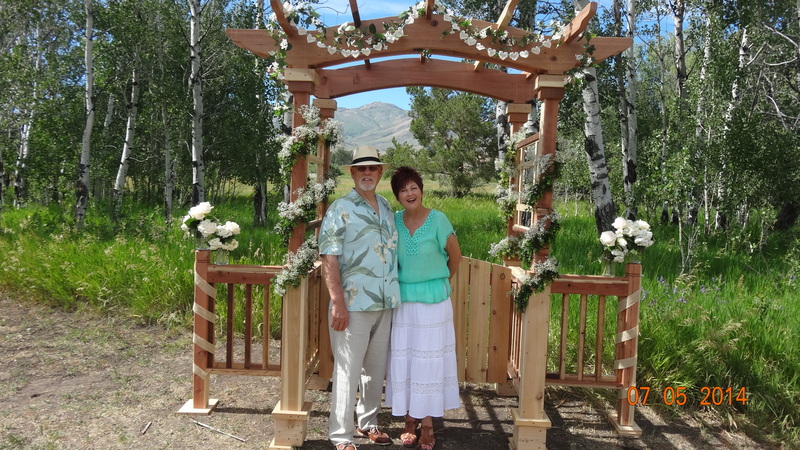 Russ and I left California on the 30th of July to be in Sun Valley and Fairfield, Idaho for my nephew’s wedding at an old fashioned, country ranch resort. Along the way Russ found it difficult to breathe and Kaiser, CA said, go directly to St. Luke’s at Sun Valley. He spent a night with unusual symptoms. Blood pressure went sky high when he would walk and heart rate dropped rather low. A wonderful doctor has walked us through all the hoops and connected us with Idaho Falls cardiologist so we could get back from the wedding to my sister Karole’s and where my dad is. I could go on and on, but with God’s grace we have continued to be supported by all the right people and his heart test where they can view his heart from flipping him around and over shows he will need a pacemaker. He is now back over at the hospital getting further tests. The Sun Valley doctor is staying on as primary and co-ordinating everything. The coolest thing has been that we could go to the wedding. We stayed in Sun Valley in the RV at my bothers. Did not try to move RV to the wedding site 40 miles away. But on day of wedding doctor let me drive Russ over and he got to enjoy the whole day. The wedding was terrific and family and friends should recognize people I hope. I enjoyed grand nieces and nephews and and all my family as well as Lisa’s lovely family. Nothing like a mountain wedding and casual outdoor eating. Russ and I were in charge of the salad for 120 plus people and lots of people helped us as they new Russ should not be doing too much cause of the high blood pressure. Feel free to open photos to larger view. Recognize my niece Kassi with her boyfriend Tony. Young love! Kay and I start shooting photos with a row of Greenawalts and Minks. The brides maids were all in similar colors but could pick their dresses. Very cool. Lisa arrives in golf cart. Lisa’s son Jamison was part of the groomsmen and did a great job. Lisa and Kreighton read a list of what they love about each other-and they were very funny. Such a beautiful family and we hope we can go to Denver before baby arrives. Karson and Alysia were so adorable-and he did the best job toasting them and she helped Kris with Bronson. What a great family we have.